The red panda (originally from China) is very distantly related to the black & white Giant Panda - but are more closely associated in modern genetics with Raccoons and Weasels. 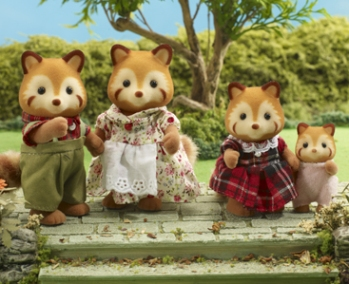 To mark the 25th Anniversary of Sylvanian Families in Japan in 2010, Epoch are releasing a special Red Panda Family featuring mother, father, sister & baby. Includes mother Shiraz, father Merlot, sister Cherry & baby girl Cranberry Redwood.